This is the first U.S. publication of an extraordinary collection of native American art, unknown to contemporary American audiences. For centuries, ornamental robes made of buffalo hide were painted by artists of the various Indian nations. Brought back to the French kings in the eighteenth century, the robes represented here and now housed in the Musée de l’Homme in Paris, and together they make a stunning tribute to a bygone art form. These robes, spectacularly executed and perfectly conserved, offer an incomparable pictographic representation of early native American life. As George P. Horse Capture observes in his essay on the craft and history of buffalo hide painting,we see the largely symbolic, complex geometric patterns painted by men, depicting battles and dances. Both kinds of design played an important role in native American society as messages for tribe members, as well as for their visitors, and both share a powerful visual appeal. 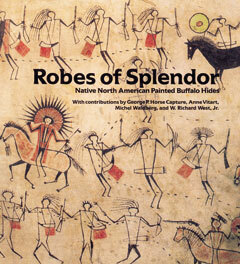 With introductory and historical essays by three leading experts on native American art, a preface by W. Richard West Jr., the director of the National Museum of the American Indians, and over a hundred photographs of the hides, this splendid volume is sure to be a treasure in any collection.